The Commercial & Retail Flooring system needs to be aesthetically pleasing without sacrificing industrial strength and lasting durability. Take away the life cycle costs of waxing, buffing, stripping, and shampooing the floor finish- a seamless polymer floor coating offers ease of cleaning & maintenance compared to other conventional floor treatments. These high-performance flooring systems are built to endure the high traffic patterns, the spills, the scuffs, the cleaners, etc. Chemical, stain, abrasion, and non-slip resistant, they’re formulated to be safe, functional, and beautiful. For fast-track projects and seamless repairs, ProREZ offers low odor, quick-setting materials for expedited return to service. Our wide array of standard or custom colors, blends, and patterns can be designed around any décor or theme. Shifts in colors or patterns can be used to delineate traffic flow, departments, etc. Special inlays, floor graphics, messages, and logos can be easily incorporated into the flooring design for a more unique presence. It really doesn’t have to be a flooring product off the shelf. Let our artistic department customize to best suit your design & budgetary requirements in creating a truly special one-of-a-kind flooring system. Department stores and boutiques require the alluring finish of a designer floor combined with industrial wear, safety, and performance. A stylistic flooring finish that needs to be hardwearing yet its visual appeal must help welcome & engage the consumer while complementing the store’s image, various departments, and product offerings. Selecting the right flooring product that unifies and complements the overall diversity and feel of a retail space can be challenging. ProREZ has the colors, blends, patterns, sparkles, and textures to customize the look while incorporating consistent & contemporary design elements- to unify the whole package. Light reflective finishes can be high gloss or satin, with built-in non-slip, wear, abrasion & scratch resistance. Easy to clean and low maintenance, these protective yet beautiful seamless polymer flooring systems will stand the test of time while helping to reduce overall life cycle costs. 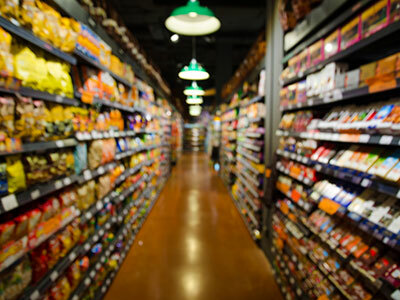 Grocery store and supermarket areas require both high functionality and decorative appeal. In high traffic areas, the floors need to be hardwearing with excellent abrasion, scratch, and varied non-slip resistance. In customer areas, the seamless flooring finishes need to offer visual appeal by welcoming & engaging customers while complementing the store’s image, various departments, and product offerings. 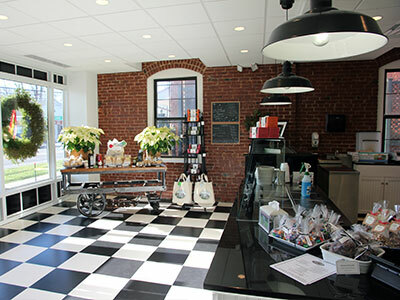 Selecting the right flooring product that unifies and complements the overall diversity, ambience, and functionality of independent areas like the deli, bakery, grocery, restroom, etc., requires careful consideration of aesthetic & performance criteria. Attractive and resistant to aggressive cleaners and stains from routine spills, these USDA compliant, non-porous, seamless flooring systems are easy to clean and low maintenance. Added hygiene and sanitation can be built into the polymer coating with Microbe◊BLOK, an antimicrobial film preservative. They will protect and beautify while helping to reduce overall life cycle costs. 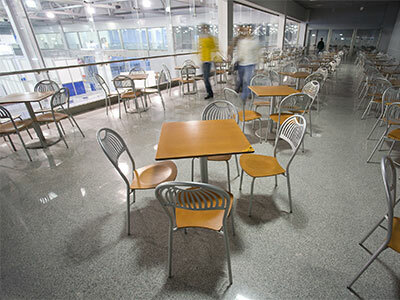 Food court areas are very busy multi-use spaces exposed to considerable activity with heavy foot traffic, dragging/scuffing/scraping of chairs & tables, as well as drops and spills of foodstuffs throughout any given day. In these areas, the food is consumed and prepared in relatively the same location. Therefore, a seamless, non-porous floor coating or resurfacing system selected in food courts will need to provide both functionality and aesthetics. The flooring system needs to be waterproof and hardwearing, with excellent impact, stain, and abrasion resistance. Ease of cleaning and maintenance are critical factors considering the long operating hours for meal service. Added hygiene and sanitation can be built into the polymer coating with Microbe◊BLOK, an antimicrobial film preservative. Unlike conventional vinyl composite flooring, a resinous flooring system does not require the long-term life cycle costs associated with waxing, buffing, and chemical stripping. As far as aesthetics, ProREZ offers an attractive range of stylish design options in various colors, patterns, and textures to complement any décor or theme.